10 years after the Simian Flu virus almost wiped out man’s kind, a nation of apes is thriving despite the virus – growing stronger and multiplies in director Matt Reeves’ most awaited sci-fi action of the year, “Dawn of the Planet of the Apes” starring Jason Clarke, Keri Russell, Gary Oldman and Andy Serkis. “Dawn of the Planet of the Apes” follows what transpired on the previously released film, “Rise of the Planet of the Apes” where Caesar, captured by Serkis, his journey took him from orphaned baby, raised in a human household, to abused prisoner in an insalubrious ape sanctuary, to the liberator of a whole army of apes, artificially evolved to super-intelligent levels by a man-made serum. That film concluded with Caesar’s community disappearing into Muir Woods near San Francisco, before the same serum, in viral form, wiped out most of humanity. 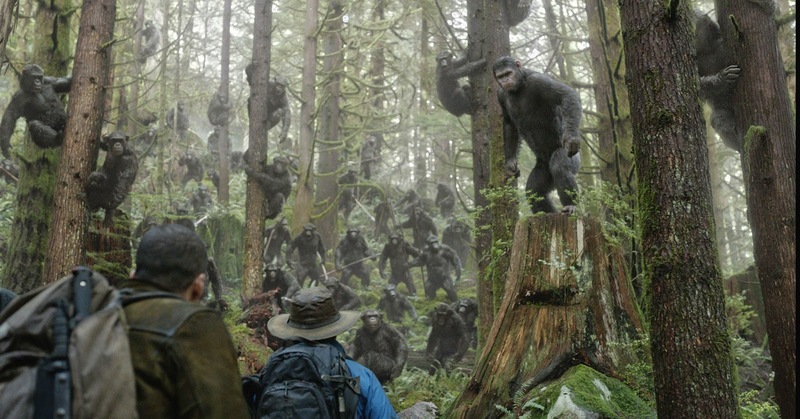 Now, “Dawn Of The Planet Of The Apes” picks up a decade later. The apes live peacefully in their own woodland territory, thinking humanity has gone forever. Then, it turns out there are virus-resistant survivors, struggling to recover in a devastated San Francisco. In this new world, a tense stand-off develops, one which leads to a potentially disastrous ape-versus-human conflict. A formidable antagonist for the humans is Koba, played by Toby Kebbell. The milky-eyed and scar-faced bonobo, introduced in Rise of the Planet of the Apes, Koba spent much of his younger life confined in laboratories, where he was subjected to experimentation in the name of science. In the decade following the apes’ liberation, Koba has evolved into a grizzled warrior who harbors a strong hatred of the human race, believing that the only good human is a dead human. A far gentler ape character is Cornelia, the young female chimp who in Rise of the Planet of the Apes was held at the San Bruno Primate Center, and who is played in this film by Judy Greer. Ten years after Caesar’s uprising against humanity, their budding relationship has blossomed. Cornelia is now Caesar’s wife and queen and the mother of his two children: an impatient and sometimes-rebellious adolescent male simian named Blue Eyes, played by Nick Thurston, and a newborn baby chimp. When Rise of the Planet of the Apes was released, fans immediately recognized that Cornelia was named in tribute to the 1968 film’s lead ape character Cornelius, played by Roddy McDowall. Given her romantic connection with Caesar, her name is also a historical reference to Cornelia Cinna, the first wife of Roman general and statesman Julius Caesar. Another ape introduced in the last film, Rocket, played by Terry Notary, is a skilled combatant and one of Caesar’s closest allies. As in Rise of the Planet of the Apes, Notary also served as the ape movement coach and stunt choreographer. Also returning is Karin Konoval, as Maurice, an ex-circus orangutan who was forced to perform for the entertainment of his human captors. Now the wise elder, Maurice serves as loyal consigliere and advisor, serving Caesar and educating the youth of his ape kingdom. “Dawn of the Planet of the Apes” (2D, 3D, 4DX) invades more than 200 theatres nationwide on July 9 from 20th Century Fox to be distributed by Warner Bros.